Emily Hockaday: Associate Editor. Victoria Green: Cover Design. 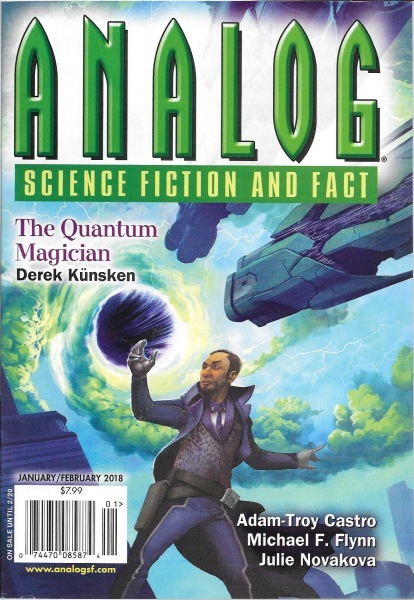 Cover illustrates the serial "The Quantum Magician". Volume CXXXVIII, No. 1 & 2. No whole number given. "The Reference Library" is the magazine's book review column and it often starts off with an introductory essay whose theme central to science fiction, in this issue is is a short general essay about Australia's place in science fiction. "On Sale Until 12/19" printed to the left of this issue's bar code box. Page five states that this issue was "Printed by Trend Offset Printing, Jacksonville, FL U.S.A. (11/27/17)". "Statement of Ownership, Management, and Circulation" on page 163.